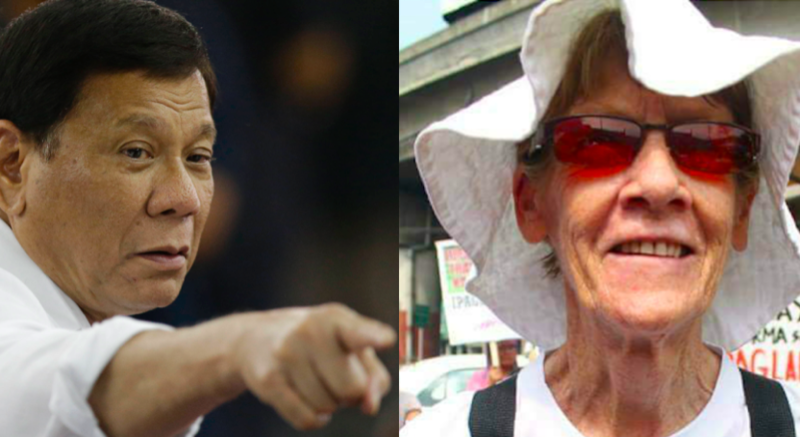 President Duterte has admitted “full responsibility” for the arrest of Australian nun Sister Patricia Fox, saying he ordered the Bureau of Immigration to investigate her. “It was upon my orders, implemented by the BI, and I take full responsibility, legal or otherwise, for this incident,” he said today (Wednesday, April 18). His words came as he was attending a change of command ceremony of the Armed Forces of the Philippines. However, the president added that he had merely ordered an investigation into Fox’s “disorderly conduct”, not her detention. However, the president then went on to rant about the 71-year-old, accusing her of badmouthing his administration. “Don’t let her in because that nun has no shame,” he said. The president also claimed Sister Patricia had made critical remarks about the government and that these constituted a “violation of sovereignty”. He also suggested she should criticise the Australian government for its own human rights violations, such as turning away immigrants. “You nun, why don’t you criticise your own government, the way you handled the refugees hungry and dying, and you turned them back to the open sea? Why don’t you rant there?” he said. He also claimed his bloody war on drugs “paled in comparison” to the violations of Australia. “At least it is criminals I order killed, how about you?” he asked. The president then warned “leftist groups” to stop inviting foreigners into the country. “You Left, do not ever, ever invite – I will never allow them in the country. If they try to enter surreptitiously, they will be arrested,” he said. Just hours before the president’s defiant admission of ordering action against the nun, his spokesman Harry Roque said “apologies are in order” because the BI had made a “mistake”. “Maybe apologies are in order because she was quickly released by the BI. Maybe the BI also makes mistakes,” he said. Following a widespread public outcry, the BI released Sister Patricia yesterday after keeping her in detention for almost a day. The bureau’s investigation confirmed that she held a valid missionary visa and had not violated any immigration laws. However, the BI has taken possession of her passport and she is expected to undergo preliminary investigation to determine if she is to be deported. The BI had originally accused the nun of “engaging in political activities and anti-government demonstrations”. She responded that she had been active in standing up for human rights issues because of her religious beliefs — not because of any political leanings. In a separate case last weekend, the BI barred Party of European Socialists deputy secretary-general Giacomo Filibeck from entering the Philippines, and immediately deported him. Filibeck, who has previously condemned the killings in the president’s anti-drug campaign, had been invited to an event by a left-wing group in Cebu City. It’s interesting how President Duterte slams “You Left,” but he himself is a leftist, a self-described socialist who has rejected the US for the far-left Chinese communist government. –none of the 13,000 victims have had a trial.